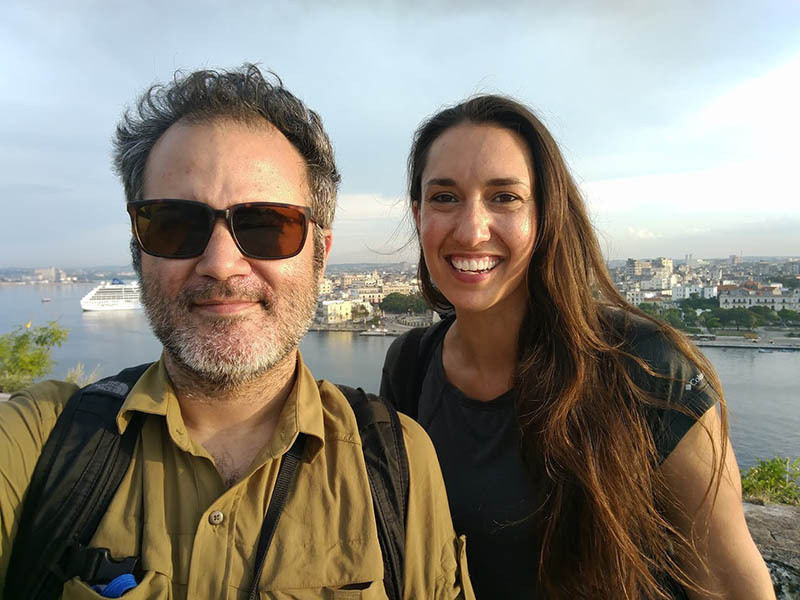 As the U.S. starts mending ties with Cuba, Seattle Times reporter Ángel González finds the island country is regaining some capitalist bustle thanks to reforms slowly doled out by its socialist government. 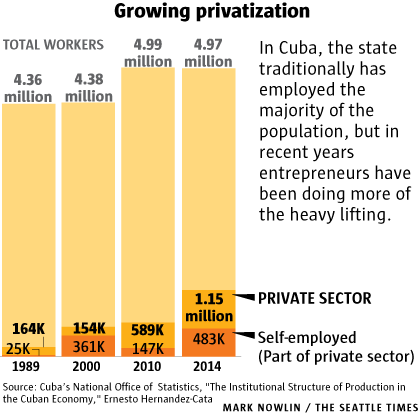 Some restaurant owners and other small entrepreneurs are prospering, but most workers still struggle on an average salary of $24 a month. The big payoff, many hope, will come with the influx of U.S. tourists. Classic cars and bicitaxis, similar to pedicabs, sputter through the streets of Centro Habana in the early morning hours. 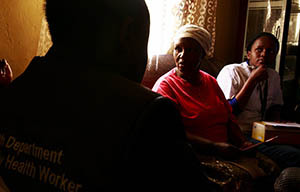 Funding for international reporting by The Seattle Times is provided by a grant from the Seattle International Foundation. I’ve come a long way to see the spot where General Ángel del Castillo Agramonte, a hero of Cuba’s long struggle for independence from Spain, made his last stand. That man, whom historians described as a “tempest on horseback,” was my grandmother’s grandfather, a U.S.-educated Cuban aristocrat who took up arms against the mother country. Despite getting killed here in 1869, the general still casts a long shadow in my family. His portrait hangs in my Redmond living room, where my 5-year-old son calls him Abuelito. 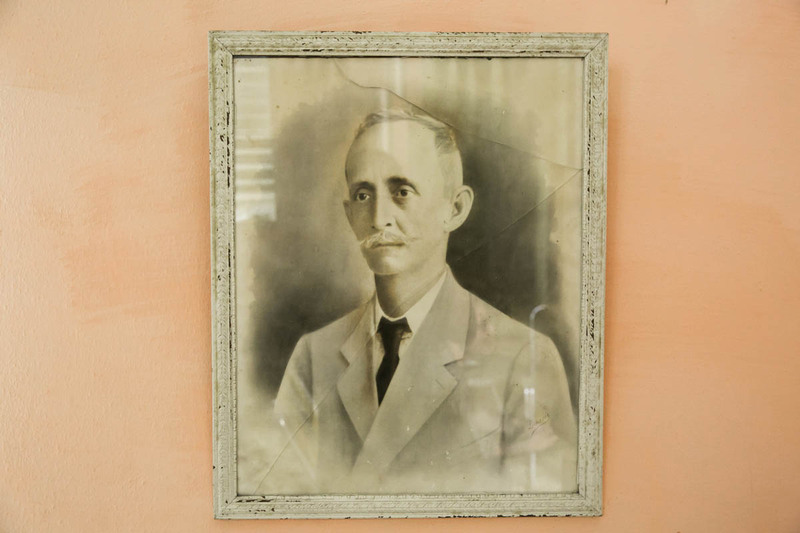 To a family that cherishes Cuban origins going back to the days of Columbus, Abuelito stands for an island that had grown fairly rich and sophisticated as the hub of Spain’s New World empire. It fiercely fought for freedom while remaining tightly linked to the U.S. and the wider Western world. That idea of Cuba was buried under Fidel Castro’s communist revolution. Hundreds of thousands, including my father and grandmother, fled the island. My uncle stayed, first to fight the revolution, then to embrace it. In time, stifling controls and a long standoff with the U.S. condemned to economic stagnation what had been a modern country, albeit one full of disparities. That conflict, as well as the state’s grip on the economy, has finally started to recede. Last March, President Obama visited the island to bury what he called “the last remnant of the Cold War in the Americas,” easing U.S. travel and trade restrictions on the island and re-establishing diplomatic relations the previous year. But a long-standing embargo remains. The Cuban government blames a big part of its economic troubles on a decades-long U.S. embargo on trade and tourism, which it says has cost the island $121 billion. Despite the Obama administration’s overtures, the embargo stands and only Congress can lift it. But experts say it’s more complicated. Carmelo Mesa-Lago, an economics professor at the University of Pittsburgh and a veteran observer of the Cuban economy, says the embargo’s impact is not as serious as it once was: Cuba trades with about 100 countries, and there are some limited purchases of food and medicine from the U.S. After Obama eased the sanctions, some U.S. companies, such as Starwood Hotels and Sheraton, are investing in the island. Mesa-Lago, who has publicly opposed the embargo since the 1960s, says the biggest problem it poses for Cuba is making international banking transactions, and therefore foreign investment, more difficult. But the Cuban government is also slow, he says, in closing deals with foreigners. Out of more than 400 proposals the government has received in the past two years, only a dozen have been approved, Mesa-Lago said. On the other hand, Gregory Biniowsky, a Havana-based Canadian lawyer who advises foreign companies, says the impact of the embargo is “massive.” It makes everything much more expensive, and the legal complications are more than many European and Canadian investors want to deal with. The biggest consequence of the embargo, Biniowsky says, is the fortress mentality it encourages among Cuba’s leadership. “It creates a mindset that is rigid, that is defensive, and slows down the process of reform,” he says. I had visited Cuba once, 15 years ago, and found the home of my ancestors a depressing ruin. This time, drawn by the specter of change, I’ve returned to get a glimpse of what kind of Cuba will emerge as it reconciles with the U.S.
Rummaging through the ashes of old family stories, I found a nation that’s slowly regaining some of its old capitalist bustle, even as it struggles with emerging inequality and bureaucratic rigidity. 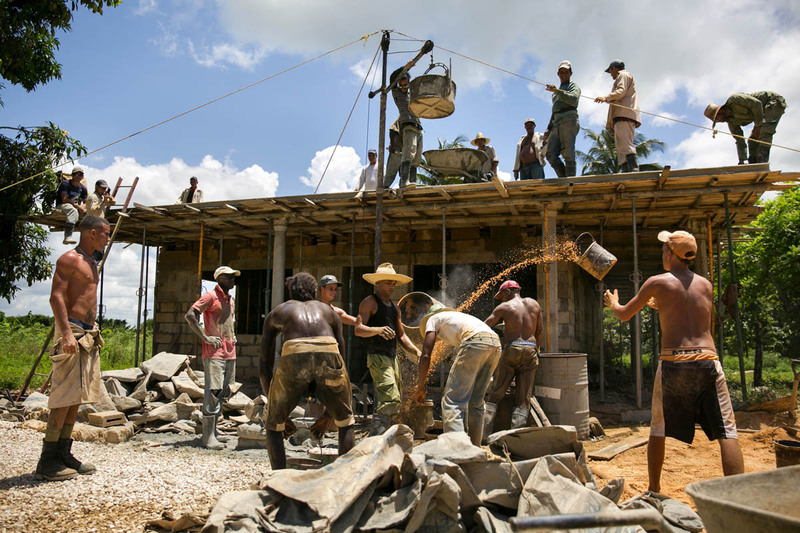 In the heat of the afternoon, Cubans build a house in the countryside in Ciego de Ávila province. The trip to Lázaro López from Havana, Cuba’s capital, takes four hours — first on a sparsely trafficked highway cutting through vast uninhabited stretches, then on the two-lane Central Road, where cars rented by tourists pile up behind ox carts. A few dusty miles off the main road near the town of Ciego de Ávila there’s a giant Cuban flag marking a monument in the lush manigua where a Spanish stronghold once stood. At age 35, Abuelito died assaulting that fort. His body, hurriedly buried by his retreating troops, wasn’t found until decades later, when a local boy digging up a root ended up pulling up the fallen general’s sword instead. A man-sized obelisk pays homage to my ancestor. As far as I know, I’m the first among Abuelito’s descendants to visit since the revolution. One thing strikes me: how well-kept this remote monument is, shaded by a red-flowered tree and flanked by manicured shrubbery. 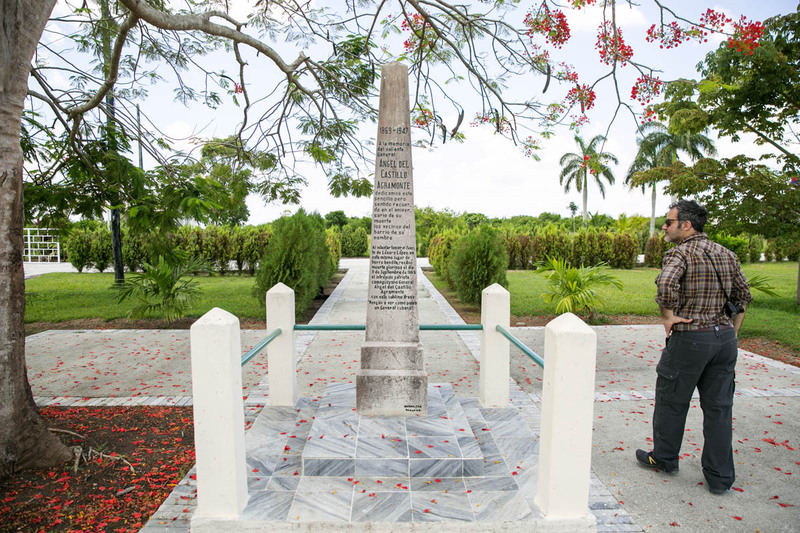 Seattle Times reporter Ángel González visits a memorial for his ancestor Ángel del Castillo Agramonte in Lázaro López, Ciego de Ávila province, Cuba. He was a wealthy planter in the late 1800s who rose up against Spain for Cuban independence, and was known for his recklessness. It’s next to a phrase by comandante Fidel Castro, praising those who study history. I guess I’ve found some common ground with the revolution. Cuba’s fight for independence from Spain was a family affair, in many cases literally, pitting Cubans against Iberian relatives. But reconciliation is well under way, as evident in the 60 percent jump in arriving U.S. passengers seen in June. There will be many more soon, as U.S. airlines have begun to fly directly to Cuba. Earlier this year, the U.S. and Cuba struck a deal that allows each country to run up to 110 daily flights between both nations. Alaska Airlines is one of the airlines approved by the U.S. government to fly, from Los Angeles into Havana. The first flight, operated by JetBlue between South Florida and the Cuban city of Santa Clara, took place Aug. 31, carrying U.S. Transportation Secretary Anthony Foxx. 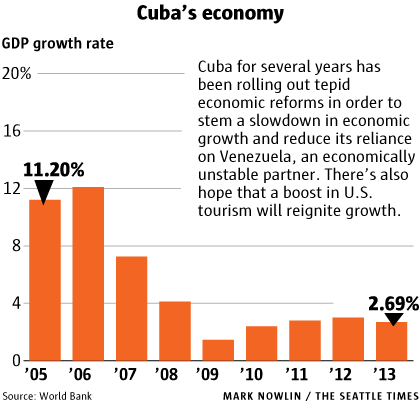 Vinay Bhaskara, a senior business analyst with Airways, a trade publication, says the number of outbound available seats from the U.S. will jump from 150,000 to more than 1 million annually as the flights ramp up. John Kavulich, head of the U.S.-Cuba Trade and Economic Council, says the influx of passengers could potentially overwhelm Cuba’s rundown infrastructure. “They can’t process three U.S.-inbound flights a day, let alone what’s going to potentially be two, three, four an hour, bigger planes, and more demanding passengers,” says Kavulich. The Cuban state will receive a huge sum of cash from passenger fees that it could reinvest in its airports, says Bhaskara. More difficult, he says, is making sure there are enough hotel rooms to receive all these Americans. 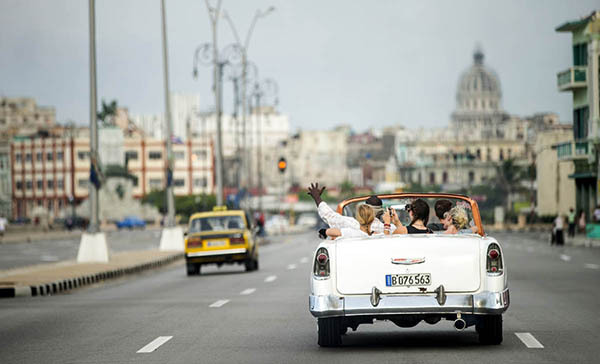 Tourists take pictures along Havana's Malecón in a convertible taxi. Cuba counts on luring millions of U.S. tourists every year, if long-standing U.S. prohibitions on travel are lifted, to prop up its ailing economy. Miguel Fraga, a Cuban diplomat visiting Seattle last spring, admitted at a talk that Cuba doesn’t have the infrastructure, but the need is a good opportunity for business investment. It’s “going to be better than the Bay of Pigs invasion, for sure,” Fraga said. It takes an hour for my luggage to clear the carousel in Havana’s teeming airport — a sign that the rekindling risks overwhelming Cubans while frustrating Americans. Past midnight, I get to walk along the city’s famous seawall. Something strikes me as different from my previous visit: The lights are on. There’s traffic. Not only old clunkers from the late capitalist era, but new Korean and French cars. In 2001, when I last came here, Cuba bore the living scars of the so-called Special Period in Time of Peace, actually a period of warlike scarcity that followed the end of a generous Soviet subsidy a decade before. Back then, Cubans were barred from entering hotels even as they had to hustle for tourism’s crumbs. Few dared speak freely. Today some of Havana’s glories don’t look so faded. Large parts of Old Havana, where I once saw streets that could have belonged in a World War II movie, are now a stunning re-creation of its heyday. Fancy restaurants, art galleries and sidewalk cafés populate grand European buildings restored over the last few years. There’s even a microbrewery in the Plaza Vieja, a 16th-century square. Habaneros, 15 years ago survivors of an economic apocalypse, seem more confident. Since the middle of the last decade, pirated foreign shows shared on USB drives allow many to follow global trends. The Obama administration’s loosening of restrictions on Cuba-bound family remittances means more money on the street. 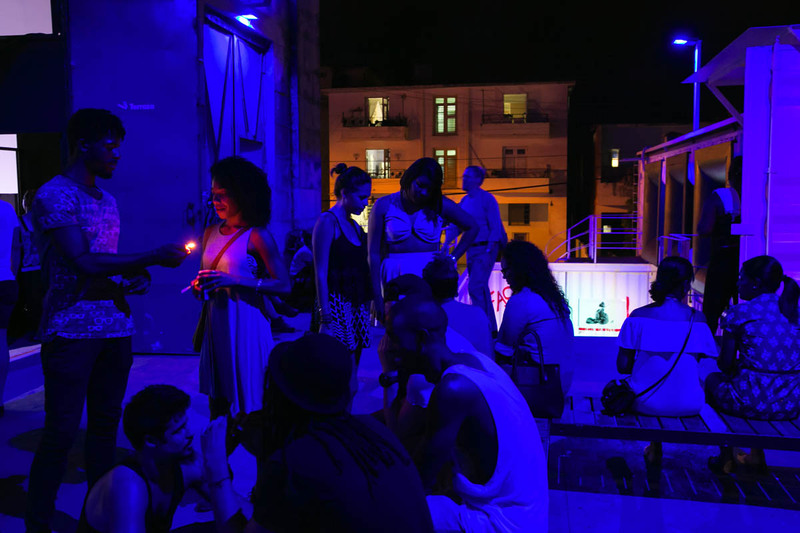 Thumping reggaeton, a blend of Caribbean rhythms and hip-hop, is everywhere, proof that despite the cliché, Cuba is not frozen in time. It just moves very slowly. But there are signs of acceleration sparked by economic reforms undertaken by Raúl Castro after he stepped in for brother Fidel. Most Cubans are now allowed to travel, buy and sell property, and start small businesses. In a town where it was famously difficult to get a nice meal, there are now more than 500 restaurants, including Asian fusion and farm-to-table fare. Shopping centers have sprouted in busy areas, giving some corners a sense of budding prosperity. In the shadow of the Habana Libre, a one-time Hilton where Fidel Castro set up temporary quarters after his triumphant march into Havana, there’s a small, open-air shopping center that wouldn’t look out of place in a tony suburb of Mexico City or Bogotá. It has several restaurants, a furniture store, a spinning salon, even a playground with inflatables for children. At a small coffee shop where many of the clients are Cubans, I ask the waitress whether the business is private. A customer, an employee at a state travel agency, barges in on the conversation. “I asked the same thing. I couldn’t believe it. Now this looks like any other part of the world,” she says. There’s also a copy shop, owned by 72-year old José Antonio Velásquez Gómez, a retired economist. He first came to Havana from his native Guantánamo with Castro’s rebels, which he joined as a teenager. He says the shopping center is owned by a state firm that leases out the space to businesses such as his store, which opened in February. What little he saw of life under capitalism before the revolution, he says, “was terrible.” But he endorses the changes that have allowed the blossoming of small businesses and even cooperatives spun off from the state. 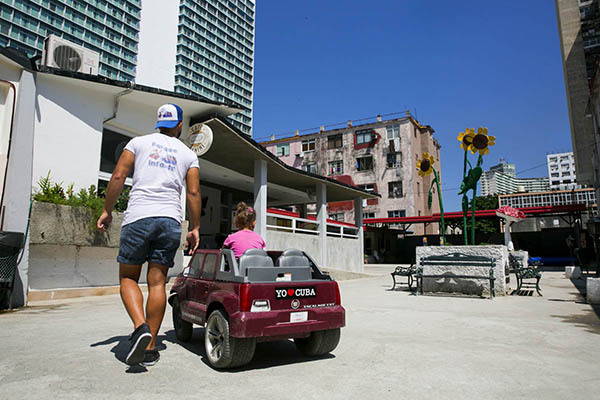 Kids take turns riding in toy cars at a "parque infantil," or kids' play park, at a shopping mall of small businesses that recently popped up in Havana. “Complex bureaucracies cannot manage these types of businesses,” Velásquez says. He is confident about the future. “Everything else can be accepted,” he said. Where the socialist state not long ago employed practically everyone, now Cubans are allowed to work at a couple of hundred types of jobs on their own. Some of these jobs are absurdly specific, such as fortune teller or button wrapper (yes, somebody who wraps buttons in fabric). But driving instructors and electricians are part of the list. It’s an acknowledgment by the revolution that its Soviet-era plans for a controlled economy are not attainable. Most Cubans are still bound to government jobs. But the government, aware that egalitarianism was not the right spur, has introduced incentive pay in some areas. 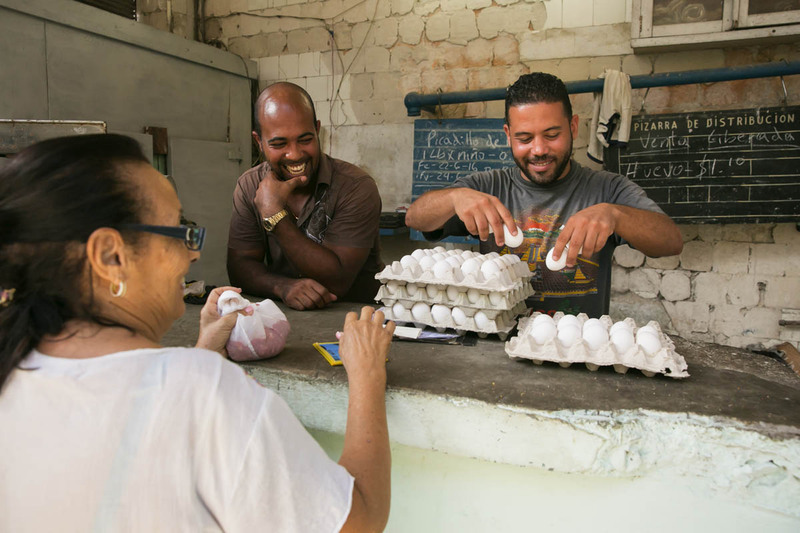 Manager Hosmay González, 33, left, and Pedro Basulto, 37, a store clerk, sell eggs to a woman according to her ration card at a corner market in Centro Habana. Hosmay González, a former lab technician who runs a state-owned meat market in Central Havana, says his $16 monthly salary can triple if he exceeds his sales quota. “We want not only Cuba’s economy to improve, but for the population to benefit,” he says. Cuba’s old cosmopolitanism flourishes, too. The Fábrica de Arte Cubano, a government-sponsored art and performance space, wouldn’t be out of place in Brooklyn or Los Angeles. A former industrial facility, it’s now brimming with the hip and the elegant. Curiously, one of the many bars in the place offers Miller Lite, an unlikely piece of contemporary Americana here. Camila Pérez, a 25-year-old bartender, found it at a local store, likely brought in by one of the many “mules” who supply local restaurants with goods bought in Miami. Pérez has her own story of separation. Her grandmother was a dissident journalist who fled for the U.S. in the 1990s, where Pérez’s father joined her. Pérez stayed in Cuba with her mom. Now living in Miami Beach, her father refuses to come back to Cuba, which he considers a hard-line dictatorship. The fortress of San Carlos de la Cabaña, which overlooks Havana’s harbor, has a dark reputation. It was long a dungeon for political prisoners, where opponents of the revolution met death by firing squad. My uncle Carmelo González del Castillo spent time here in 1962 for plotting against Castro. Now throngs of Cuban and foreign tourists come to see the nightly firing of the fortress’ cannon. The Adonia, which in May was the first U.S. cruise ship to touch Cuban ports in more than a half-century, has just sailed out of the harbor. The ship is a portent of the expected arrival of mainstream U.S. tourists, a potential money gusher. But that bounty may not come in time to save Cuba from a painful economic reckoning. A big part of the reason Cuba was able to rebound from the Special Period is a 16-year-old deal in which Venezuela provides cheap oil in exchange for Cuban doctors and other technicians. It’s been like a Soviet subsidy redux. 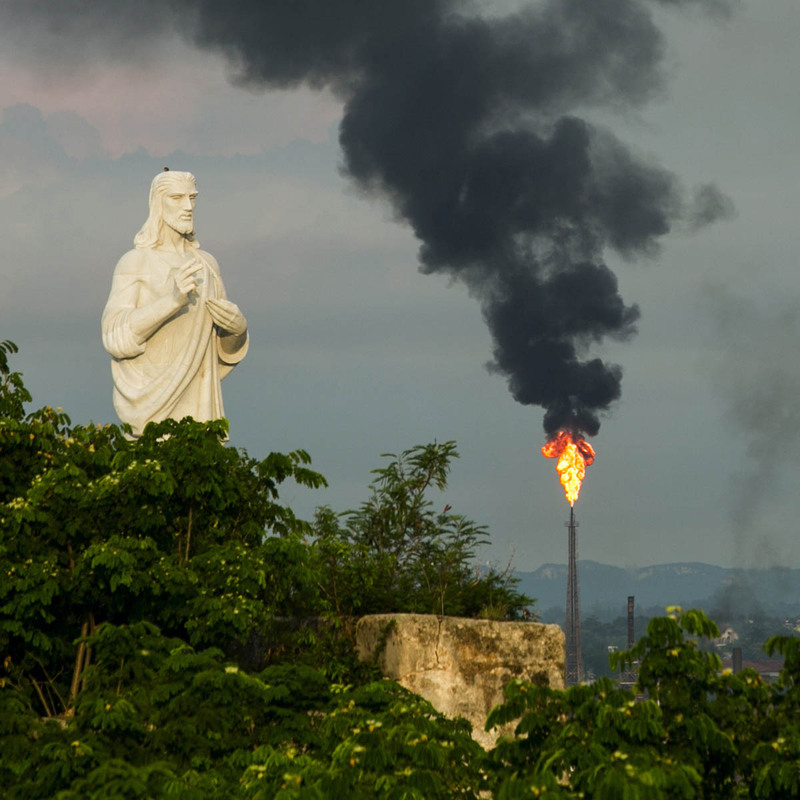 LeftTop: The Christ of Havana statue overlooks the flare stack of the Nico López oil refinery in Cuba. 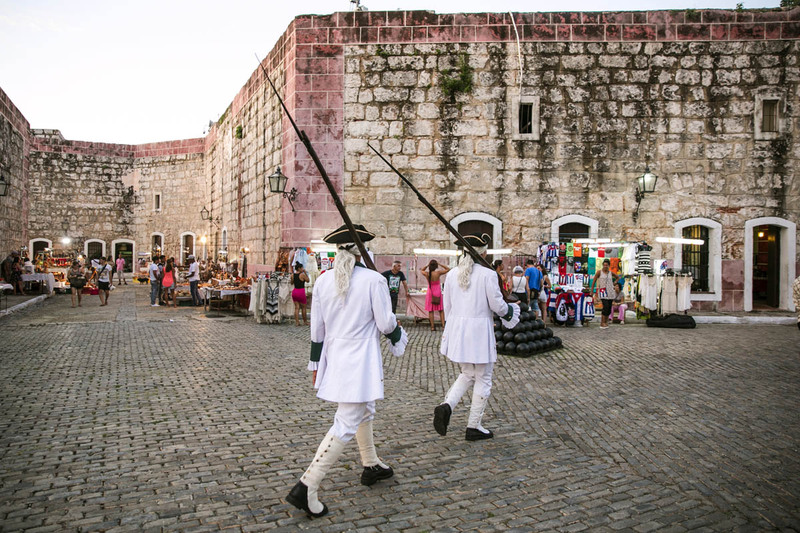 RightBottom: Reenactors dressed in their 18th century military regalia walk by the tourist booths for their 9 p.m. cañonazo ceremony, where they do a formal procession and fire a cannon, at the Fortaleza de San Carlos de la Cabaña in Havana. 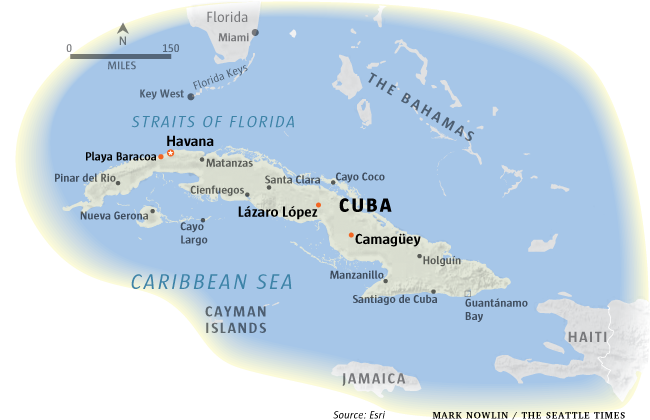 1511: Settled by Spain, Cuba becomes a platform for the conquest of the New World. 1800s: Cuba becomes the world’s main purveyor of sugar, importing African slaves. 1868: Planters in eastern Cuba free their slaves and start 10-year war against Spain. 1898: U.S. enters Cuba’s second war of independence, wrests island from Spain. U.S. troops won’t leave until 1902. 1959: Revolution ousts dictator Fulgencio Batista. Fidel Castro aligns with Soviet Union and clashes with U.S.
1991: Fall of Soviet Union rocks Cuba economically, but Castro regime survives. 2008: Raúl Castro officially becomes president. Some reforms start. 2014: The U.S. and Cuba begin unraveling their long standoff. That lifeline is threatened by Venezuela’s ongoing collapse, the result of the oil-rich country’s attempt at Cuban-style socialism. “Cuba has very few options if net deliveries by (Venezuelan oil company) PDVSA fail to materialize,” says Jorge Piñon, a Cuba energy expert at the University of Texas. Already the Cuban government has mandated cuts in fuel and power consumption, sparking fears of a new Special Period. There’s also the question of whether freer markets will lead to multi-party democracy. Cubans seem looser with their complaints than 15 years ago, even to foreign journalists. Iván Montenegro, 67, a former laboratory employee who in retirement can barely make ends meet, says he is disappointed with the revolution. “They exploited me,” he says. But the government keeps a tight rein on dissidents and a monopoly on media. 14ymedio, a news site run by government critic Yoani Sánchez, can’t be accessed from public Wi-Fi hot spots, even though Spain’s El País and The Wall Street Journal can. A TV cameraman I spoke to said that while there’s more room on newscasts to report on what people are talking about on the streets, some subjects remain taboo, such as a rise in vagrancy. “What seems like a great victory is instead a great defeat,” he said, referring to the reforms. Raúl Castro, who is now 85, says he will hand power to a new generation in 2018. But few expect Cuba’s one-party state to change much. Gregory Biniowsky is a Havana-based lawyer for Gowling WLG, a global law firm. He helps foreigners navigate investment opportunities here. 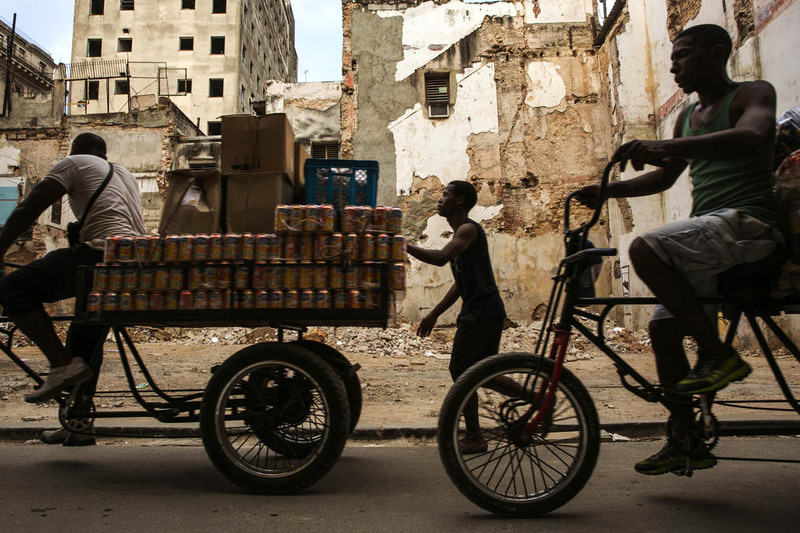 Men deliver goods to market by bike in Havana — a common sight due to the high price of cars. Biniowsky, a thoroughly Cubanized Canadian from British Columbia who has lived here on and off since the Special Period, says the government envisions reforms that would make citizens more prosperous, but economic objectives remain subject to political ones. More than a surrender, the state’s aggiornamento is an adaptation to a world where Cuba has no more patrons. One thing that puzzles experts is why Cuba’s reform process is so sluggish. Raúl Castro has said the country is moving ahead “without haste, but without pause” toward sustainable socialism. But in an April speech to the latest gathering of Cuba’s powerful Communist Party, he acknowledged things were not moving as fast as they could, with only 21 percent of approved reforms put in practice. Some interpret the comments as a hint of an ideological battle going on behind the scenes. Cuba’s No. 2, José Ramón Machado Ventura, is seen as a hard-liner, embodying Fidel Castro’s aversion to free markets. Mesa-Lago estimates that Cuba doesn’t need a major political upheaval to allow its highly educated population to be more productive and lessen the country’s dependence on outsiders. If the country enacted the same agricultural reforms that in China and Vietnam let small producers decide what to produce, for how much to sell it and to whom, “in four years Cuba would be self-sufficient in food,” Mesa-Lago says. Then again, the paths the country follows have eluded most soothsayers. “Cuba is unpredictable,” Mesa-Lago says. Idania del Río, the well-traveled owner of Clandestina, a design store in old Havana that sells irreverent prints and clothing, says Cuba has transitioned from a place where people “have been cooking in their own stew” to a more open society. Many young people right now prioritize making money. “Lots of people don’t care about politics, they’re more focused on achieving their own goals,” del Río says. 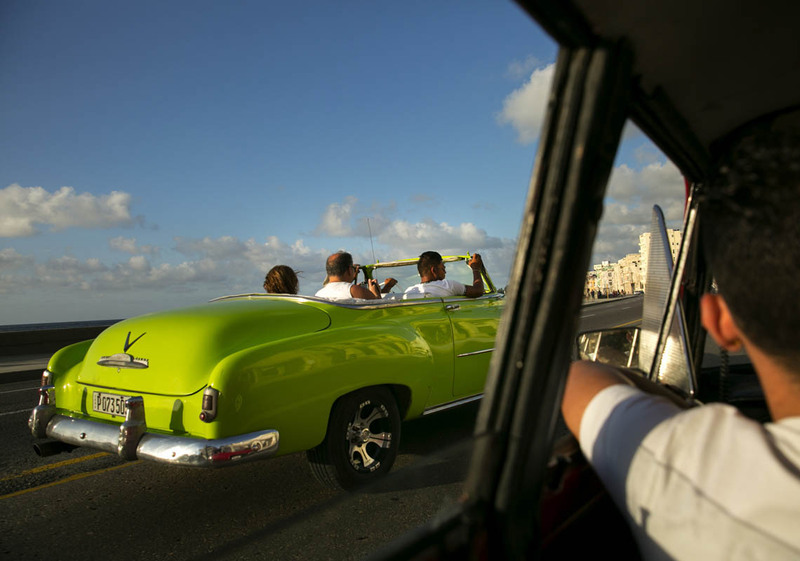 LeftTop: Taxis cruise down the Malecón on a steamy late afternoon in Havana. 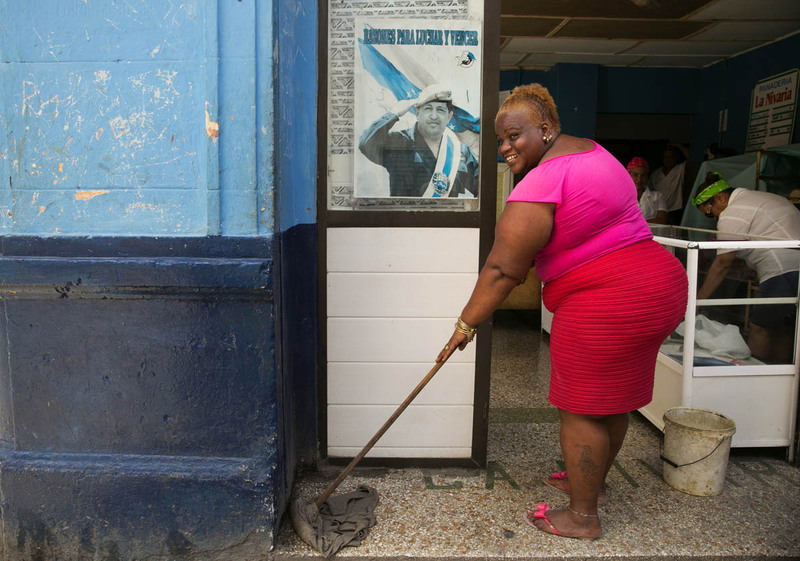 RightBottom: Liseet Castillo, 39, mops the floor of a bakery in Centro Habana next to a poster of Hugo Chávez, former Venezuelan ruler, and a main ally of Cuba and Fidel Castro. Money is all the more important as inequality is on the rise. 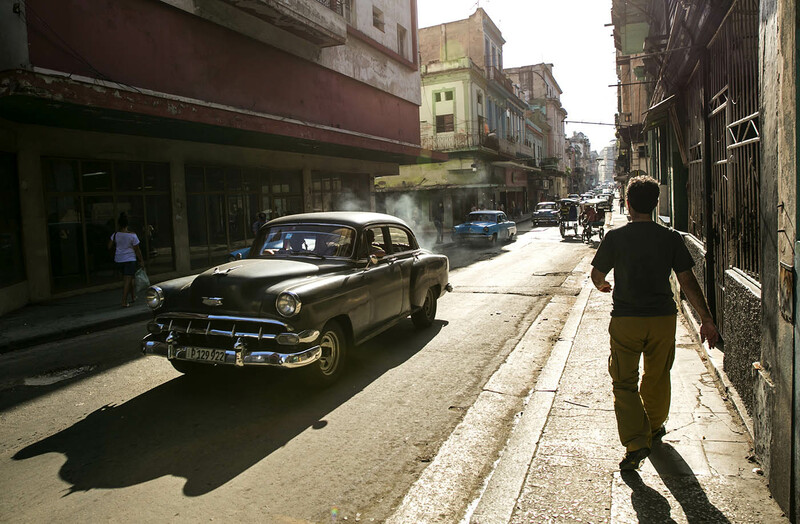 While taxi drivers and others working in tourism can make hundreds, if not a thousand dollars a month, Cuba’s average monthly salary is about $24. “I take home every night more than a doctor makes in a month,” boasts a young employee at a fancy bistro in old Havana. There are certainly more things to buy in Cuba than a decade ago. But only those with access to hard currency from family remittances, their own business or a tourism job can buy them. The situation is pushing 79-year-old Amor Ortiz into entrepreneurship. The retired tourist guide’s pension amounts to $9 per month, so she wants to sell her grand apartment in central Havana to buy two smaller homes: one for her family, and one that she’ll run as a guesthouse. University students, who under the old rules would have been relatively privileged upon graduation, now face stark choices. Engineers and doctors, if they’re to practice their professions, look forward to paltry state salaries (a doctor can make about $60 a month). “Here only business people have a future,” says a pharmacy student at the University of Havana, who added that she’ll emigrate as soon as she gets her degree. 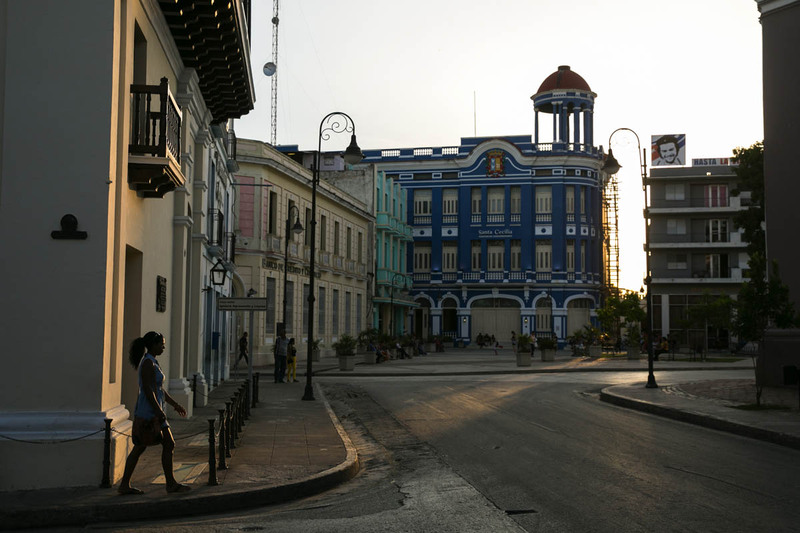 Abuelito was born in Camagüey, a town of 300,000, Cuba’s third-largest city. It was founded in the early 16th century by his ancestors, ruthless captains of the Spanish conquest who begat a clannish aristocracy that grew rich on cattle and sugar. Many old families lost it all fighting for Cuba’s independence. Their crumbling crypts dominate Camagüey’s sun-baked general cemetery. My uncle Carmelo, who embraced the revolution after being released from prison, lies here, among his folk. The last time I came to see Carmelo’s grave, in 2001, I was tailed by state security for asking too many questions about my uncle’s ups and downs with the regime. Camagüey’s warren of streets, which locals say were laid out to confuse pirates, felt to me like an asphyxiating, decaying maze. 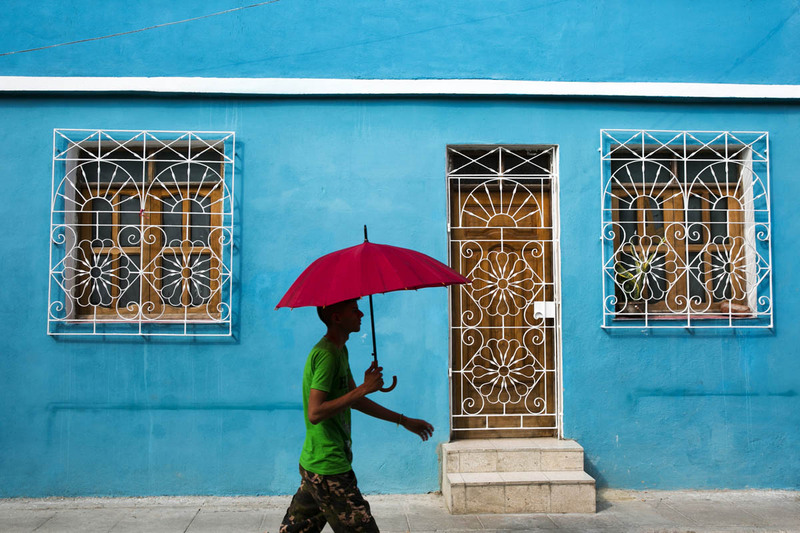 LeftTop: The streets of Camagüey, Cuba are brilliant colors, set off by a red umbrella to keep the sun away. RightBottom: A taxi driver behind the wheel of a classic Pontiac Silver Streak in Camagüey, Cuba. Now nearly every building in the ancient downtown seems to have a new coat of paint, with soot and moss giving way to bright blue, turquoise and orange. 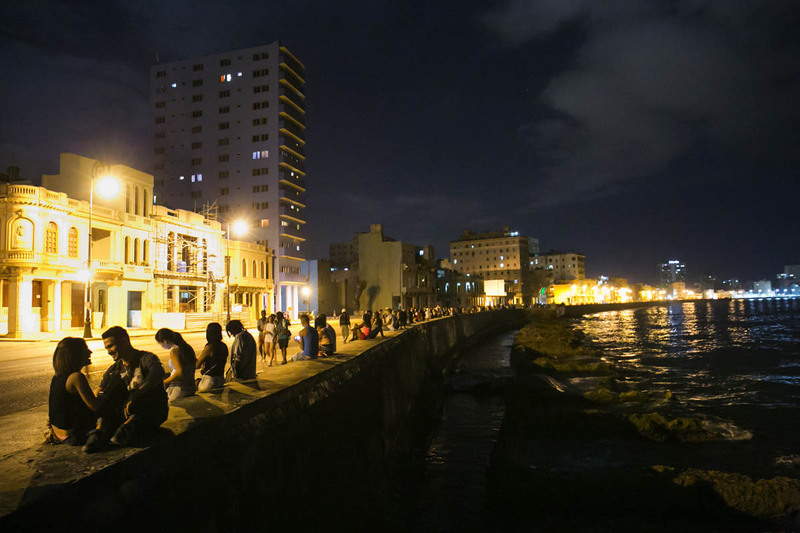 The city was declared a UNESCO World Heritage site in 2008, the year Raúl Castro began the economic reforms. During my visit thousands filled the streets at night to celebrate the feast of Saint John, a major holiday. Commerce has seen a renaissance, too. A furniture store confiscated by the revolution from my great-uncle, and later abandoned, is now reborn as a busy government-run emporium. A Korean LCD TV sold there for about $400, topping the average yearly wage. “Don’t you see how pretty Camagüey has become?” asks my cousin Livita Castillo, whom I surprise with my visit. But Camagüey is still a hard place to make a living, as the tourists fueling Havana’s vibrancy are rare. The Special Period has left enduring wounds. Horse-drawn carriages, which became popular when the Soviet oil supply dried up, remain a common mode of transportation. Here many of the self-employed are former or even current state workers just trying to make ends meet. “I don’t have any hope. I worked a lot for the system. 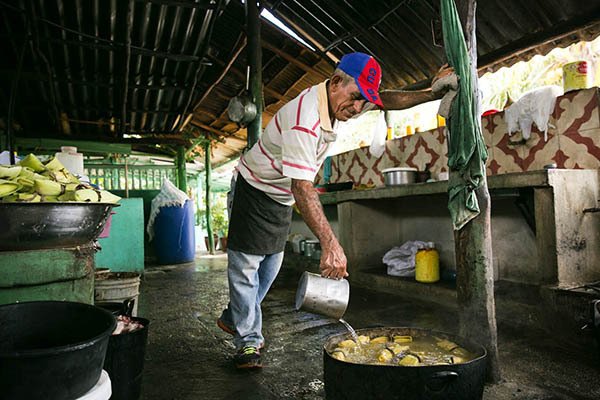 I cut a lot of sugar cane, thinking that I could live with my pension,” says Félix Brugos Díaz, a 68-year-old who complements his $10 monthly retirement with the $20 to $25 he makes from selling plastic clothespins at the train station, along with a dozen other hawkers. San Juan de Dios square is perhaps Camagüey’s most beautiful, a window into an elegant if blood-soaked past. In 1873 Spaniards brought here the corpse of Ignacio Agramonte, the city’s most famous patriot. Abuelito’s sister, Ángela, took a lock of hair from the body to Agramonte’s widow in New York. The square now houses 1800, a privately owned restaurant that showcases how big bets can squeeze through what remains a partial opening. Owner Edel Izquierdo, 44, is the son of a retired lieutenant colonel of the Ministry of the Interior, Cuba’s internal security forces. Izquierdo never thought about leaving during the Special Period. Fluent in English, he landed a bartending job, which led to other roles in tourism. 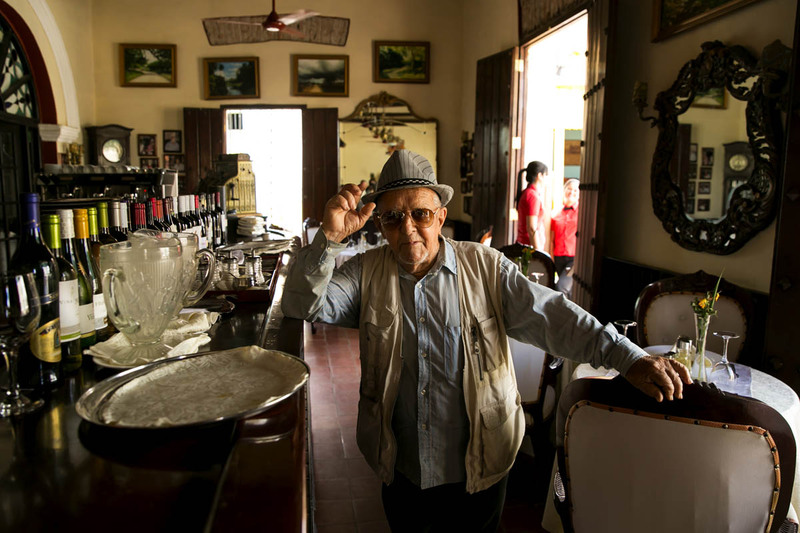 Efraín Izquierdo, 90, stands in Restaurante 1800, his family's gleaming and successful paladar, or privately-owned restaurant, in Camagüey, Cuba. The Izquierdos sold property and got a loan to transform the building into a restaurant, and after opening in 2012, are planning to expand. He knew the picturesque colonial mansion his father lived in was a good location for a restaurant. In 2012, after the government allowed Cubans to sell real estate for the first time in decades, he took the plunge. Izquierdo had scrounged $20,000 from his career in tourism; he sold his own house for $40,000 and borrowed $30,000 from a friend because he couldn’t get a bank loan. It was a bold move, but it worked out. On a June night 1800 was packed while a neighboring state-run restaurant stood empty. An explosion in the number of restaurants epitomizes the surge of Cuba’s private sector, which remains tightly tied to tourism. But the hurdles these restaurateurs face also underscore how hard it is to undertake a capitalist revolution in Cuba. The biggest challenge is finding supplies, restaurateurs say. There’s no network of wholesalers (although in July the government opened its first wholesale store catering to businesses). So restaurants buy items at retail prices at the local bodega, or they strike under-the-table deals with farmers and state employees at food depots. Some go so far as to get rare ingredients from the closest Costco Wholesale — in Miami — through well-established networks of travelers who charge by the pound. “There’s not a pickle to be had in Havana,” said the owner of a private restaurant focusing on Eastern European cuisine. Capital is also scarce, in many cases supplied by family members abroad. So is knowledge of the grittier aspects of commerce. Parra helped design a curriculum for InCubando, a course run by FIU and Miami nonprofit initiative StartUp Cuba to teach Cuban entrepreneurs the ropes of capitalism. The first batch of entrepreneurs attended the program last summer. Ernestino Medina, the chef at La Paladar Maria in Taguasco, Sancti Spíritus, Cuba makes tamales, adding water as it boils off over open flames. Paladars are privately-owned restaurants, as opposed to state-owned - they are generally higher quality, and in cities, more expensive. In 2013 Izquierdo bought the adjacent property and last year another house up the street, where he’s opening a tapas bar. Izquierdo doesn’t pooh-pooh the revolution. He likes its legacy of egalitarianism and safety, a state that aims to take care of basic needs. I wonder if the revolution’s appeal will fade when its elderly authors are out of the picture, their famed defiance made irrelevant by peace with the U.S.
Then I think about the French Revolution of 1789, which spilled a lot of blood. Its lofty principles of freedom, fraternity and equality are core to modern France. So is the bellicose, revolutionary-era Marseillaise. Will 1959 have a similar half-life here, Che Guevara in tow? Izquierdo feels the latest changes are irreversible, and deeper restructuring will in time solve Cubans’ economic problems. Further reform isn’t likely while 90-year old Fidel Castro, the one-time rebel who broke with Cuba’s capitalist past, is alive, he says. Internet connections are scarce and pricey in Cuba, but they make life less isolated. For some savvy entrepreneurs who’ve found a way around the government’s strict controls, renting Wi-Fi connections is a way to make a living. A family in Camagüey uses a Wi-Fi hotspot in a public plaza to let a baby girl talk with her father. In the shadow of Our Lady of Solitude, a landmark temple built centuries ago by a long-gone aristocracy of cattle barons and sugar planters, dozens of camagüeyanos peek into their smartphones and tablets as they jostle at dusk for precious bandwidth at the local Wi-Fi spot. Many gather in family groups as they video-chat with relatives abroad; others, seeking a bit of privacy, use headphones with mouthpieces. In this island bastion of communism, surfing the internet is a collective experience. 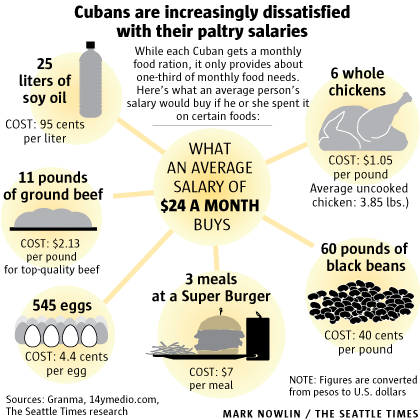 In a country where the average monthly salary is $24 and a pound of ground beef costs $2, how can people survive, much less have about the same life expectancy as Americans? A large majority of Cubans own their homes. Health care and education are technically free, although resource-challenged. Other prices are heavily subsidized too: Going to a movie costs about 25 U.S. cents. And Cubans get about a third of their monthly food needs for less than $2 through a ration card system instituted in 1962. It’s not a generous allotment. Per person, it’s five eggs per month, a pound of chicken, a few pounds of rice and other items, although the very young and the elderly get better rations. That means people need to secure food elsewhere. But where do they get the money? Those who work in the private sector are OK, according to Carmelo Mesa-Lago, a prominent scholar of the Cuban economy and University of Pittsburgh professor. Those who have family abroad are also in luck. Relatives overseas send money, pay directly for luxuries such as cellphones and bring consumer goods on their trips home. Florida International University economics professor Jorge Salazar-Carrillo estimates that émigrés’ largesse amounts to $6.6 billion a year, when combining cash with gifts in kind. That’s equivalent to about $600 for every Cuban. Mesa-Lago, the University of Pittsburgh scholar, says that at least half the population receives remittances. But that leaves the other half out, creating fault lines that stretch not only along economic, but racial lines, too. Because a majority of exiles are white, and so are their family members in the island, Afro-Cubans are more likely to be left out of the loop, Mesa-Lago says. 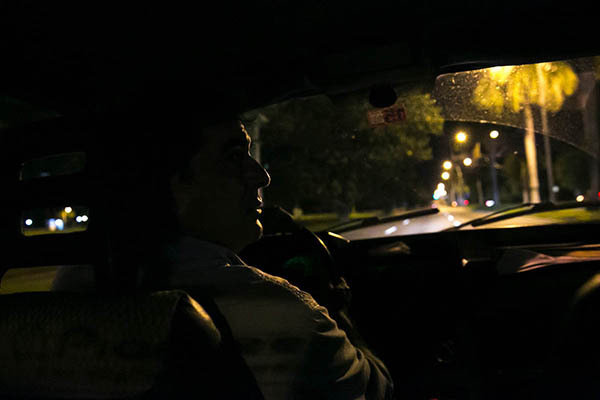 Fernando started his professional career as a doctor, but then chose to drive a taxi to make better money. Doctors reportedly now make up to the equivalent of $67 per month, whereas taxi drivers for foreign tourists can make over $600 per month. It’s not a cheap pastime. ETECSA, the state communications monopoly, sells prepaid cards that provide one hour of access for $2, or about one-tenth of the average monthly wage here. The cards can be hard to find, scooped up by resellers who peddle them in plazas at a 50 percent premium. 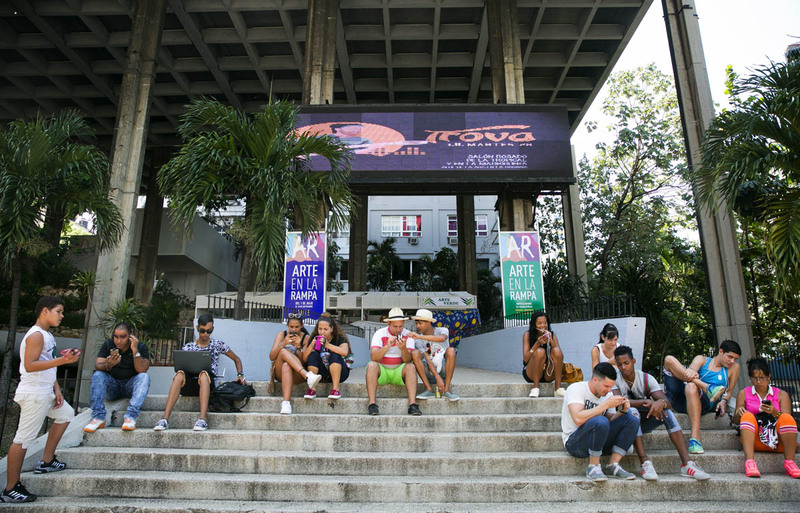 Women use internet access cards sold by ETECSA, the government-owned telecommunications company, outside the Habana Libre hotel. The cards are expensive for Cubans, costing two Cuban Convertible Pesos, equivalent to a $2 value, per hour of access. That is approximately 10 percent of the average Cuban monthly salary. But, as often is the case in Cuba, savvy people find ways around the rules. For less than a dollar, one can piggyback onto someone else’s public Wi-Fi hookup for an hour. It’s illegal, but the authorities don’t seem to care that much. For a historically cosmopolitan people splintered by waves of exile and migration, the public Wi-Fi spots are an essential tether. LeftTop: Jorge Luis Alemany, 64, talks with his granddaughter at a Wi-Fi hotspot in Camagüey, Cuba. He and his wife, Caridad Morell, have two children and three grandchildren in the United States. 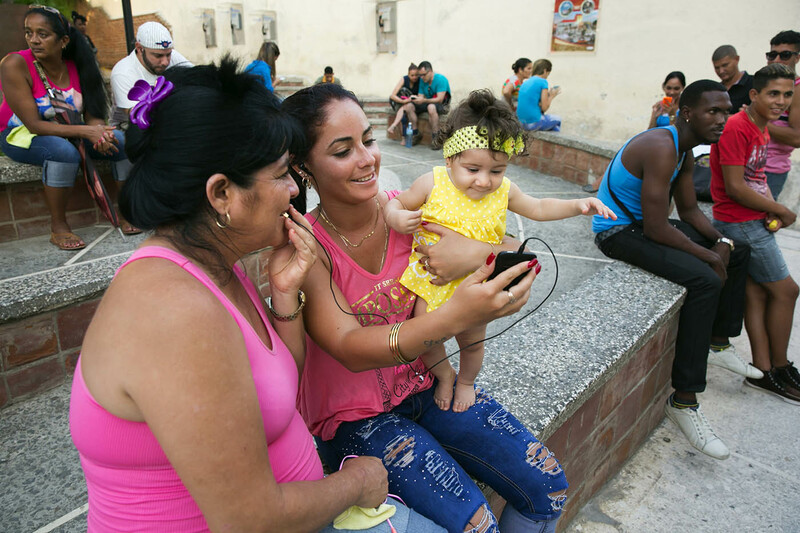 RightBottom: A family at a public park with a Wi-Fi hotspot in Camagüey passes around a phone to have a video chat with a baby relative in another country. “This is the only thing that makes us happy,” says Caridad Morell, 64, sitting with her husband on a bench along Calle República, Camagüey’s main commercial thoroughfare, video-chatting with her two sons who live in Kentucky. 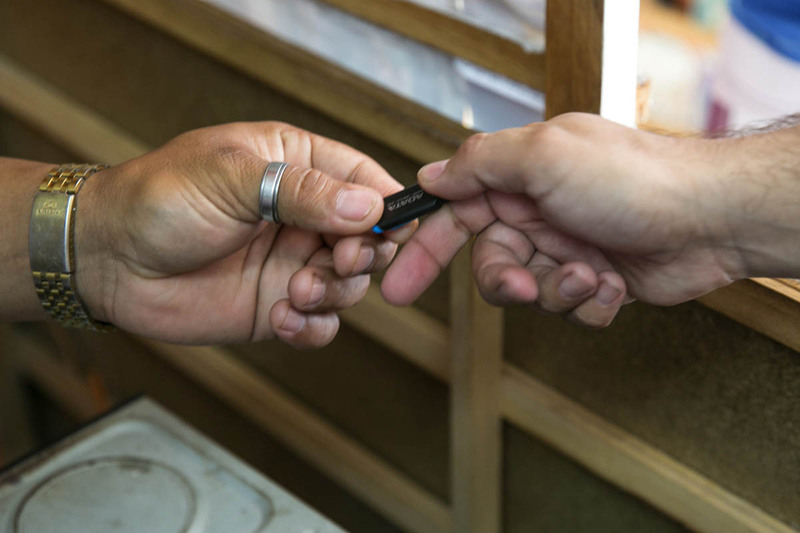 The hardships of getting online in Cuba, and the resourcefulness Cubans muster to do it, reflect the contradictions of a country attempting a controlled approach to globalization, which some here clamor for and others fear. 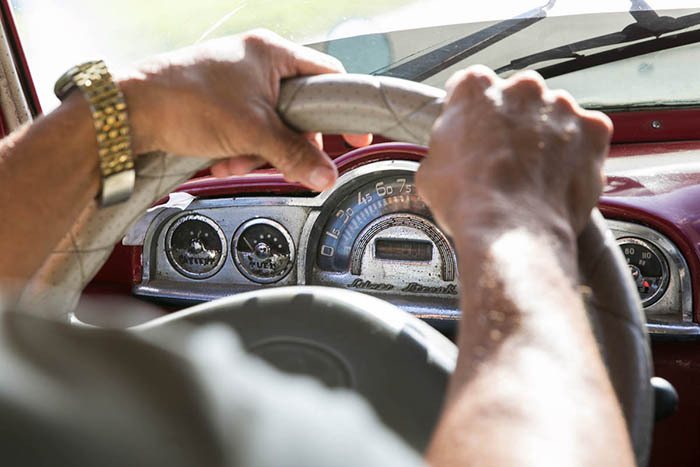 The most shocking thing about cars in Cuba is not how old they are, but how expensive, a sign of the distortions created by the country’s nether-zone between socialism and capitalism. Not many cars are imported by this island nation, making new vehicles scarce. Further enhancing their value is that a car represents a foothold in the tourism industry. 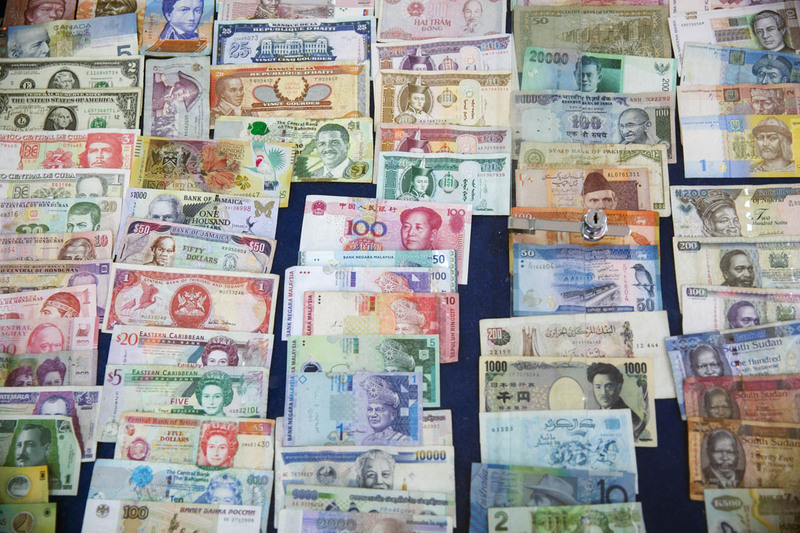 Driving tourists around means access to hard currency — and to a life of relative privilege. That means a 2012 Kia Rio, a compact car with 44,000 miles on it, last July was being sold on Revolico.com, Cuba’s version of Craigslist, for $63,800. The same car in Seattle, according to Kelly Blue Book, would be worth $8,191. Old clunkers from Cuba’s capitalist, pre-1959 era are a relative bargain in comparison. A ’51 Dodge — fitted with an Isuzu engine, a Hyundai gear box and steering from a Russian Lada — was offered for about $12,600 on the same site. That represents 52 years of earnings on a typical salary here. 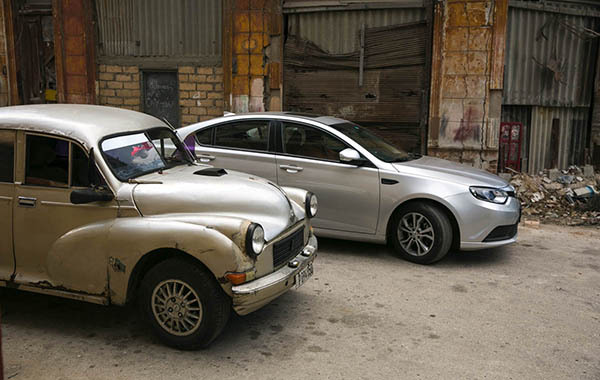 Older cars still reign in Havana, but newer models are creeping in. There’s also no such thing as an AutoZone. Parts are rare and expensive, most often having come in a suitcase from Miami. A faulty component can trigger a frantic round of phone calls to a driver’s network. Or one can simply go to Revolico, where a set of brake pads for a Daewoo Tico sold for $77. The same item on eBay retailed for $14.86. The government still wants to control access to the internet. But authorities also realize its potential to foster the economic growth Cuba’s citizens badly need — and their unquenched appetite for information. 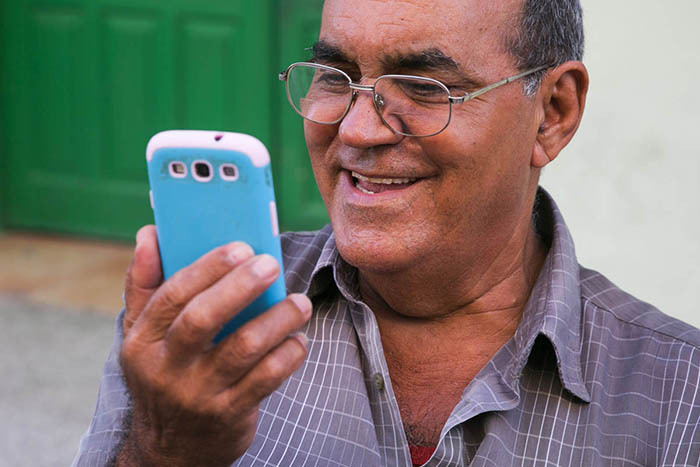 Less than 0.1 percent of Cubans have a fixed broadband subscription, compared with 10.5 percent of Costa Ricans and 31 percent of U.S. residents, according to the World Bank. 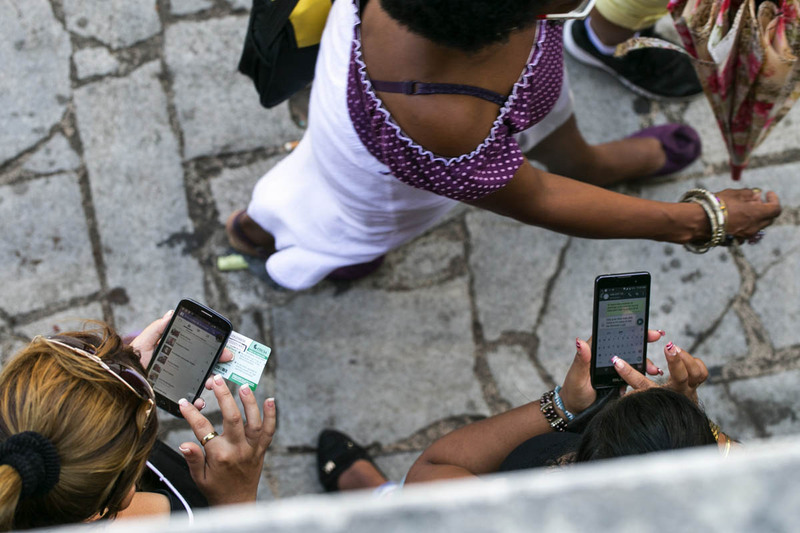 Still, 30 percent of Cubans use the internet. That’s well below the Latin American average, but it shows the popularity of the 200 or so Wi-Fi hot spots the Cuban government has set up as it tries to satisfy soaring demand. No other place epitomizes the Cuban government’s ambiguous relationship with the internet better than the Museo Orgánico de Romerillo, a museum in a poor neighborhood in the western outskirts of Havana. That’s a sign of the institution’s deep alignment with the values of the Cuban revolution. The museum is endowed with a broadband internet connection, which the artist first shared with the neighborhood via computer terminals for which people take a number and line up from 7 a.m. to midnight. Each person has a 30-minute window to surf the web. 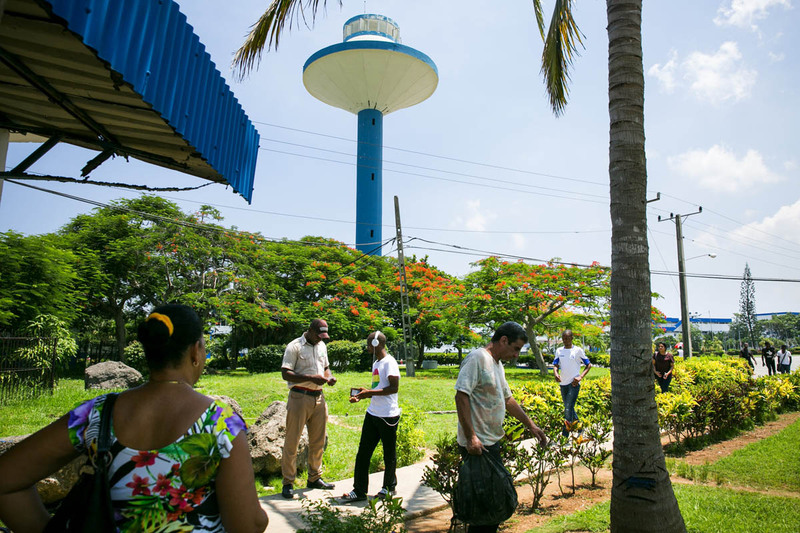 Kcho also added a free Wi-Fi hot spot, a feature that draws people here from as far as central Havana. Free Wi-Fi, though, comes with a dose of revolutionary fervor. Security guards greet visitors with the politically correct title compañero (comrade). The Wi-Fi password is “abajo el bloqueo” — “down with the blockade,” which is what the Cuban government calls the U.S. trade embargo. 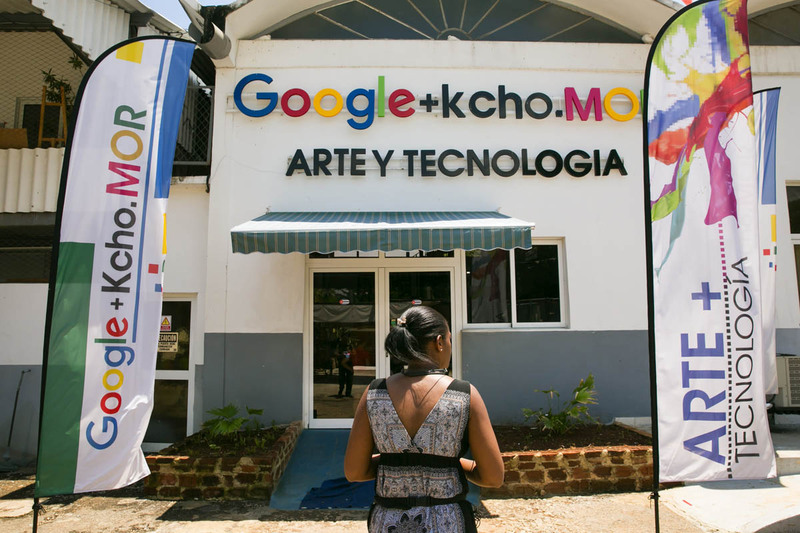 Whatever its vows of resistance, Kcho’s museum has turned out to be the beachhead of the U.S. internet juggernaut Google in Cuba. In March 2016, as President Obama visited the island, the Mountain View, Calif., search giant set up a hall here with about 20 Chromebook computers and virtual reality headsets connected to ETECSA. A Cuban flag and a big portrait of Fidel Castro wearing a baseball cap hang above a sign that reads “Google Cultural Institute,” while Cuban internauts check Facebook or chat with their loved ones overseas. Manuel Bridón, a 23-year-old soldier, is talking with his grandmother, who lives in Rochester, N.Y. He comes from San Miguel del Padrón, a suburb on the other side of Havana. It’s a one-hour journey, “sweaty and hot,” but it’s worth not having to pay outrageous amounts, he says. Manuel Bridón, 23, right, a soldier in the Cuban army, talks with his grandmother in Rochester, N.Y., in a video chat on one of the computer terminals at the museum's Google center. Still, a Silicon Valley denizen would have a fit: Access here is painfully slow — and not always reliable. 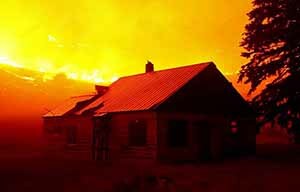 “The computers have to be disconnected when there are thunderstorms,” Bridón says. The people who run the museum see internet access as a tool in service of a greater goal, that of spreading culture and revolutionary ideals. 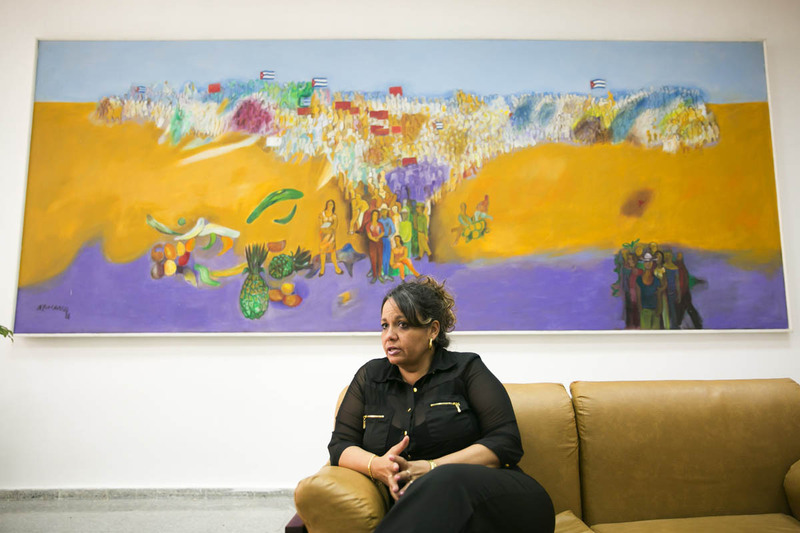 “Free internet is the ideal hook,” says museum guide Quirenia Montejo. 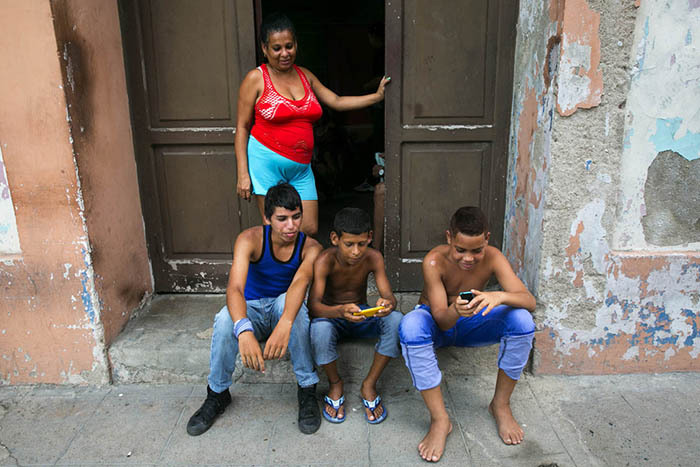 LeftTop: Boys play games on their cellphones on the stoop of a house in Camagüey, Cuba. Only a privileged few can afford the most basic internet access in their homes, so many entertainment options are offline. 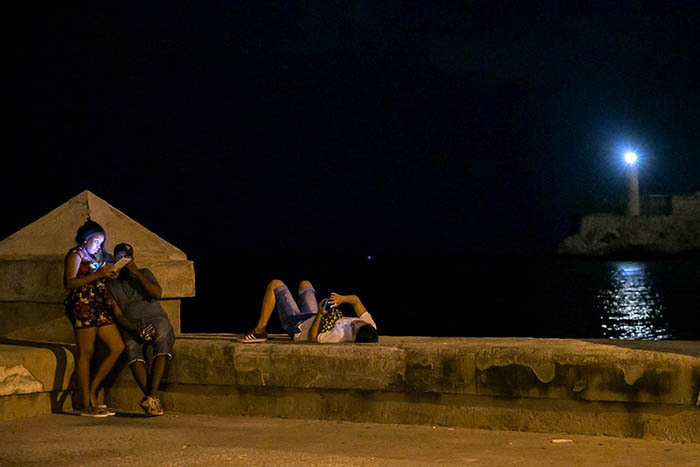 RightBottom: People are illuminated by the glow of their smartphones and the beacon of the El Morro lighthouse along Havana's Malecón after midnight. The internet may be slow, and the path to a Silicon Valley-style bonanza is dubious, but that doesn’t mean Cuba lacks its share of tech entrepreneurs willing to give it a try. A few have achieved a milestone that eludes many a U.S. startup: black ink. AlaMesa rents office space at a five-story government building in the Havana neighborhood of Playa. The large, empty space has only a couple of desks, but it comes with a glorious view of the Florida Straits. And a rare privilege in Cuba: an internet connection. It’s not cheap: Alí says the 512-kilobit-per-second connection costs about $300 a month. But it’s better than heading out to the public access Wi-Fi park in La Rampa, a bustling avenue in central Havana, which is what he and his co-founders did before getting the office. They also share the space (and bills) with Fonoma, the brainchild of Cuba-born, Spain-based Hiram Centelles. It’s a company that lets Cubans overseas recharge the cellphone and internet accounts of family members and friends back home. Centelles is also the founder of Revolico, Cuba’s version of Craigslist, a site that was blocked for years by the government (Cuban news site 14ymedio.com reported that the blockade was quietly lifted in August). Fonoma is much less controversial. After all, it does something the state is very interested in — injecting hard cash into the Cuban economy. 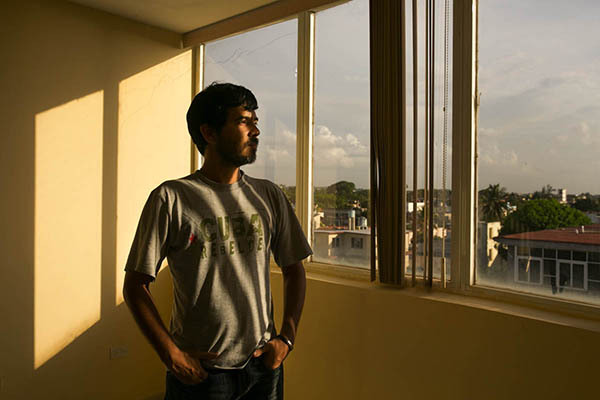 Alfonso Alí is an entrepreneur with a startup called AlaMesaCuba at his office in Havana. Companies like Centelles’ live in a sort of limbo: It wasn’t until this year that the Cuban government announced small and medium private businesses would be made legal. But things are changing fast, so for Centelles a perch here was worth the effort. “We wanted to have a foot in the ground to figure out what’s happening in Cuba,” Centelles said in a phone interview from Spain. “Things that were impossible five years ago are now possible,” Centelles says. Internet entrepreneurs also face the daunting technological challenge that their Cuban audience doesn’t have access to the web all the time. AlaMesa walked around that obstacle by making its entire database downloadable; it’s also distributed through physical channels such as el paquete, a USB drive. So far more than 15,000 people have downloaded AlaMesa’s mobile app, Alí says. It’s a sign that there are more than just a few Cubans with cash to burn at a pricey, privately owned restaurant. El paquete comes with ads and coupons for local businesses. And it enables local startups to gather an audience. It’s a vehicle for Revolico, a local version of Craigslist. In the past, the site has been blocked by authorities, according to its founder, Hiram Centelles. There’s no politics, and not much in the way of news. 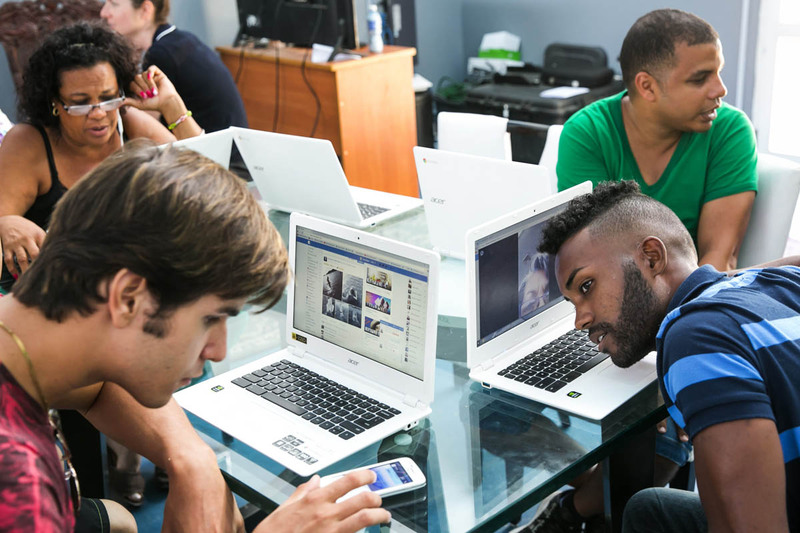 People in Cuba’s fledgling internet industry say that lets the government turn a blind eye. It’s still illegal, though. “Most people request telenovelas,” says the owner of a “copy center” in Camagüey, who didn’t want his name disclosed. An interested user brings a USB drive and requests specific shows. Buyers can monitor the copying process through a big computer monitor. The cost: 15 pesos, slightly more than half a U.S. dollar. In Havana, there’s a new paquete available every day, according to the copy center owner. But in Camagüey, it’s a weekly deal. The dearth of internet access also has let an alternative ecosystem of apps flourish. People exchange photos, music and files using Zapya, a file-transfer app that creates a hot spot for other devices. Instead of Google Hangouts or Skype, many use Imo, a messaging and video-chatting app. Connectify, which turns a computer into a hot spot, is what powers the cottage industry of black market Wi-Fi providers mooching off the public Wi-Fi spots. Anywhere there is shade and places to sit, Wi-Fi entrepreneurs, like the man third from left, will set up a hotspot, like this one in La Rampa in Havana. 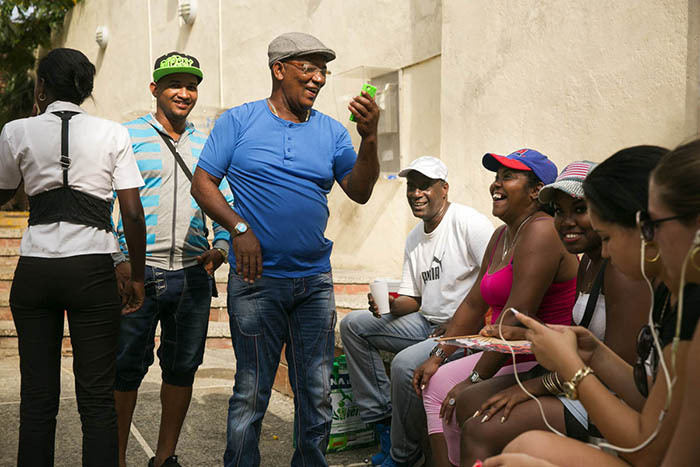 One of these hustlers, who wants his name withheld, charges the equivalent of $1 for one hour of connection in La Rampa, Havana’s most-happening avenue, an area with big hotels, government buildings and Coppelia, a famous ice-cream parlor. He says he left his job as a bartender to do this for a couple of hours a day. With eight to 10 people connecting per hour, it’s not bad money. “People make do with what they have,” the 22-year-old says. Cuba’s renowned health-care system, which flourishes despite the country’s poverty, still has lessons to teach the world, experts say. Hundreds of U.S. students have attended medical school tuition-free in Cuba, including a UW grad who plans on returning home to practice in underserved communities in Kitsap County. 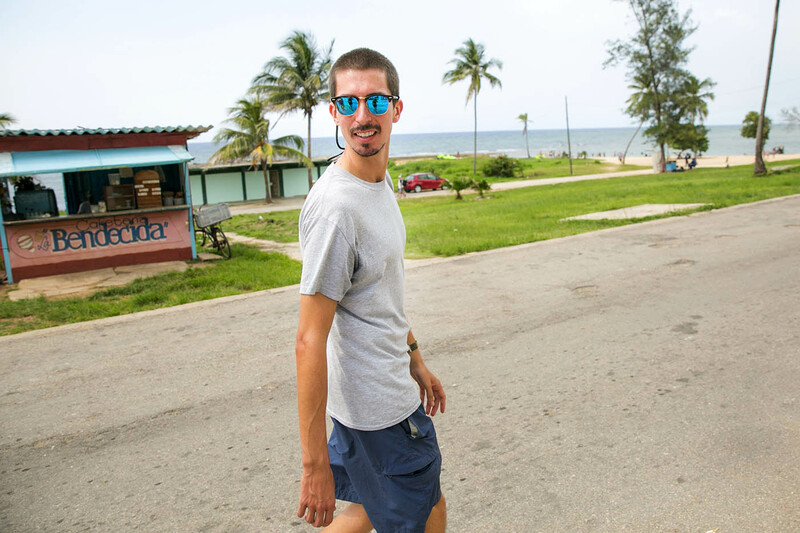 Sol Bockelie, a medical student at the Latin American School of Medicine in Cuba, walks in Playa Baracoa, the beach town where he lives while attending school. Bockelie, 30, who attended University of Washington, is from Bremerton. Sol Bockelie, a 30-year-old medical student from Bremerton, has figured that the skills he needs are behind the last remaining curtain of the Cold War in the Western Hemisphere. Bockelie and close to a hundred other U.S. students are enrolled in an international medical school founded in 1998 by then Cuban leader Fidel Castro to train doctors from the developing world. Here they learn an approach to health care that has been recognized as equitable and cost-effective, emphasizing preventive medicine and the immersion of doctors in the communities they serve. Dubbed the Latin American School of Medicine, or ELAM by its Spanish initials, the tuition-free program has so far graduated more than 25,000 doctors, mostly from relatively poor countries in Africa, the Middle East and Latin America. Hundreds of Americans, too, have trained here with the aim of practicing medicine back home, the Cuban way — in underserved communities, focusing on family practice and prevention, making do when there aren’t a lot of resources available. “I came here to understand what it means to be a Cuban doctor and apply it back home,” Bockelie said in an interview during the last week of classes. That means becoming a “médico de ciencia y de conciencia” — a doctor endowed both with scientific know-how and a conscience, he says. Bockelie’s journey highlights the lasting glamour of what’s perhaps Cuba’s proudest achievement, health care that outperforms that of some developed countries. That success contrasts with other legacies of Communist rule, including a weak economy and lack of freedoms other Western countries take for granted. But the American cohort here is smaller than in previous years, a sign of how Cuba struggles to pay for utopian ideals while trying to refashion its failed economy. The number of scholarships given by the Cuban government to U.S. students was cut in half a couple of years ago because of lack of money, according to Rachel True, director of Medical Education and Cooperation with Cuba, or MEDICC, an Oakland-based nonprofit that helps ELAM U.S. graduates practice at home. Currencies on display at the Latin American School of Medicine show the diverse countries that the students of the school come from. The tuition-free program has so far graduated more than 25,000 doctors, mostly from relatively poor countries in Africa, the Middle East and Latin America. As the U.S. mends ties with Cuba, Bockelie’s prospects showcase what Cuba’s bare-bones but effective health-care sector can teach its American counterpart. In addition to posting stellar life-expectancy and infant-mortality rates, Cuba manages to do cutting-edge research in cancer vaccines and revolutionary diabetes treatments on a shoestring. Some U.S. universities are interested. This year the medical school at Michigan State University was the first U.S. university since the Cuban revolution to send its students into Cuban hospitals. While the hospitals are where “we were decades ago” and severely lacking in equipment, the Cuban health-care system is “good if not better than most Western countries, including the United States,” says Dr. Bill Cunningham, of Michigan State. Bockelie, the son of a long-time Cuba solidarity activist, applied to ELAM four years after graduating from college, and didn’t consider U.S. schools. “Cuba was what I wanted,” he said. Starting out Bockelie lived on campus, where students sleep in spartan dorms equipped with bunk beds. Now he pays for a room in the nearby town. Bockelie intends to practice rural medicine a la cubana in Kitsap County, an area with medically underserved pockets, particularly among Native Americans. But first he’ll have to overcome the obstacles all ELAM graduates face when returning to the U.S.
After devoting seven years to the ELAM coursework and hospital practice in Cuba, American students must pass certification exams at home. They also have to enter competitive residency programs whose directors may not be familiar with Cuban medicine, says Dr. Paul K. Drain, a University of Washington global-health professor who has studied the Cuban health system. But “some of the residency programs might say — what is this?” Dr. Drain said. Some ELAM graduates in countries such as Costa Rica have had trouble getting their degrees recognized. ELAM officials blame protectionism or a misunderstanding of the school’s true goals. “Sometimes people get confused and think this is a political project, but that is not the case,” said Dr. Heidi Soca Gonzalez, ELAM’s vice dean for academics, in an interview. MEDICC’s True says normalization of U.S.-Cuba relations may make her organization’s goal of spreading the gospel of ELAM among residency programs easier. “Maybe they’ll be more open to learning what Cuba actually has to offer,” True said. One successful ELAM doctor opens doors for others. The Contra Costa Family Medicine Residency program in Martinez, Calif., took in Brenda Bondi-Boyd, a 2009 graduate now practicing family medicine in the area. Bondi-Boyd “did really well. That made it easier to get the next person,” said Dr. Kristin Moeller, head of the residency program, which is now enrolling its fourth ELAM graduate. Students leave school on the last day of finals before summer break at the Latin American School of Medicine, about 20 miles west of Havana. The school is in a former naval academy, hence the old watch tower. ELAM lies some 20 miles west of downtown Havana in a massive former naval academy built when Soviet-backed Cuba feared a U.S. invasion. The school was founded in the wake of hurricanes Mitch and Georges — which devastated Central America and the Caribbean — in order to train doctors from the afflicted countries. Some 3,000 students attend classes in the breathtaking, sea-facing campus. During a recent visit, African, Latin and Middle Eastern youths streamed out toward a bus stop, bound for Playa Baracoa or bustling Havana. Spanish, which nonnative speakers have to take for a year in addition to the standard six-year program, is the lingua franca. Other languages are spoken, too. “When you walk down the hallways, you hear Arabic, French, Laotian,” Bockelie said. Dr. Soca, the vice-dean, says students from more than 134 countries have enrolled in the program. That said, living in Cuba, a country where most consumer goods are unaffordable to locals, is not easy. Besides room and board, ELAM students get a living stipend of 100 Cuban pesos, or about $4, a month. That can buy you two hours of internet access. Students spend a couple of years at the campus (nonnative Spanish speakers will have to add one extra year) and then move on to different hospitals. The Cuban government pays the way for every U.S. student. Soca didn’t disclose how much it cost the Cuban state to bankroll the program, but she said foreign students usually pay about $80,000 to attend other medical programs in Cuba. That means ELAM is an outsized investment for Cuba at a time when its own health-care sector is pinched. Many doctors and nurses flee overseas, while some who remain drop out of the health-care system altogether for better-paying tourism jobs, such as driving taxis. Foreigners and Cubans familiar with the hospital system say that in many locations the conditions are critical. Rooms can be dirty, waits long, and patients are required to bring their own medicine and even bedsheets. One person familiar with the workings of a hospital reported seeing syringes being sterilized for reuse instead of thrown away. The hardship seems about to get worse as an oil subsidy from Venezuela is endangered by that country’s crisis. ELAM has had to make cutbacks. True, the MEDICC director, says that the Cuban government used to offer scholarships for 27 or so U.S. students, but in the past two to three years the incoming groups have shrunk to between 10 and 15. True says Cuba has struck deals with other countries that help pay for their citizens’ education at ELAM, but an existing U.S. embargo makes such a deal with America impossible. When asked about the future of the ELAM program, Dr. Soca said that there was a steadfast commitment to training the world’s doctors. “One can never have too many doctors.” Cuba remains committed to training a global “white-coated army,” Soca said. Dr. Heidi Soca González, academic vice-dean of the Latin American School of Medicine in Playa Baracoa, Havana, Cuba, says students from more than 134 countries have enrolled in the program. Americans began coming in 2001, in the wake of a visit to Cuba by a Congressional Black Caucus delegation. Cuba wanted to bring in U.S. students of mostly poor and mostly minority backgrounds. Applicants are chosen by the Interreligious Foundation for Community Organization, a nonprofit that’s long supported Cuba. For Bockelie, who majored in political science at the University of Washington, Cuba’s socialist approach was alluring. But the alternative to incurring hundreds of thousands of dollars of medical-school debt was welcome, too. “We’re debt-free when we’re done,” Bockelie said. So far, 116 U.S. students have graduated from ELAM, including 12 who got their degrees in July, according to MEDICC. Of these, 65 have either finished or are completing a residency program in the U.S. A majority work in family medicine. Those who haven’t been able to pursue a medical career in the U.S. have a variety of reasons, said True, the MEDICC director. 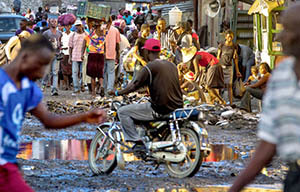 Some decide to pursue a nonmedical career, while others move to other parts of the world, including earthquake-ravaged Haiti. MEDICC offers financial support to pay for expensive U.S. licensing exams and online practice tests. True says 75 to 80 percent of ELAM graduates have passed the first licensing exam on their initial try. That’s similar to students from other international schools, according to the U.S. Medical Licensing Examination website. Dr. Mena Ramos, who finished her residency at the Contra Costa Medical Center and practices in the emergency department there, graduated from ELAM in 2011. She says her adviser at Brown University, where she got her undergraduate degree, was against her going. But if she had to make that choice again, ”I’d absolutely choose to go back to Cuba to study medicine,” she said. Once in her residency, she found the toughest thing was to adapt to a system where patients come with various types of insurance that determine the coverage they get. She was also new to gun violence and substance-addiction cases. In Cuba, “I think I saw one case” of gun violence in six years, she said. 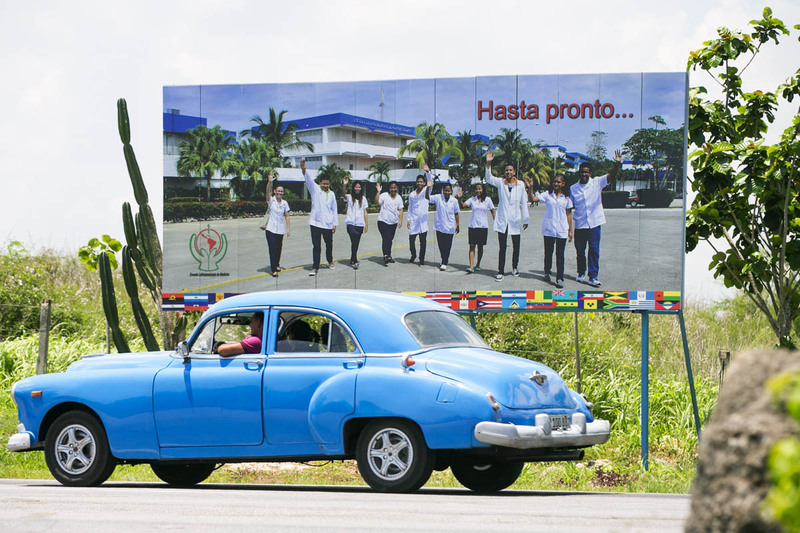 A billboard featuring medical students along the main road says “See you soon” to those leaving the Latin American School of Medicine in Playa Baracoa. Bockelie, who just started his third year at the school, expects to graduate in 2021. He says he is undaunted by the challenges posed by lacking in Cuba the same bells and whistles doctors have in the U.S.
“You acquire a level of creativity in this environment where you don’t have access to everything,” he said. Ángel González is a business reporter at The Seattle Times, where he covers Amazon.com. A graduate of the University of Paris 2, he went to journalism school at University of California, Berkeley. He’s a former bureau chief of Dow Jones in Houston. Born in Caracas, Venezuela, he was raised with his Cuban grandmother’s family stories of pirates, poets and liberators. Phone: 206-464-2250. Twitter: @gonzalezseattle. Email: agonzalez@seattletimes.com. Bettina Hansen has been a staff photographer at The Seattle Times since 2012. She is a native of Phoenix and attended journalism school at Arizona State University. She previously worked at the Hartford Courant in Connecticut. She covers a mix of sports, news and features and is always looking for a new community story. Twitter and Instagram: @bettinahansen. Email: bhansen@seattletimes.com.